As near as I can find, Bishop A. J. Carney left behind four things. 2. 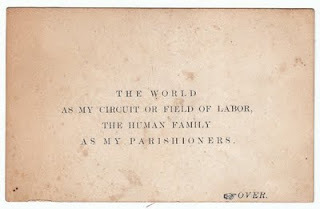 The quote "The world as my circuit or field of labor, the human family as my parishioners. 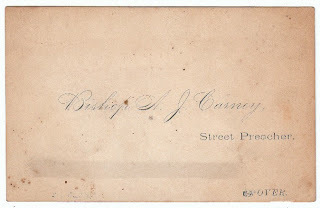 "Bishop A.J. Carney, and independent missionary preached a characteristic sermon in the streets this morning. He didn't forget to take up a collection"
"Bishop A.J. Carney, the street preacher, is in jail for 100 days at Rochester. An official laughed at him and he raised his hand in wrath, inflicting a heavy blow. When arrested, he attempted to cut his throat with a pen-knife. Bishop Carney is the same individual who spoke in our streets some three months ago"